Congratulations to Caden Steffen for currently being ranked the #14 170 lbs. 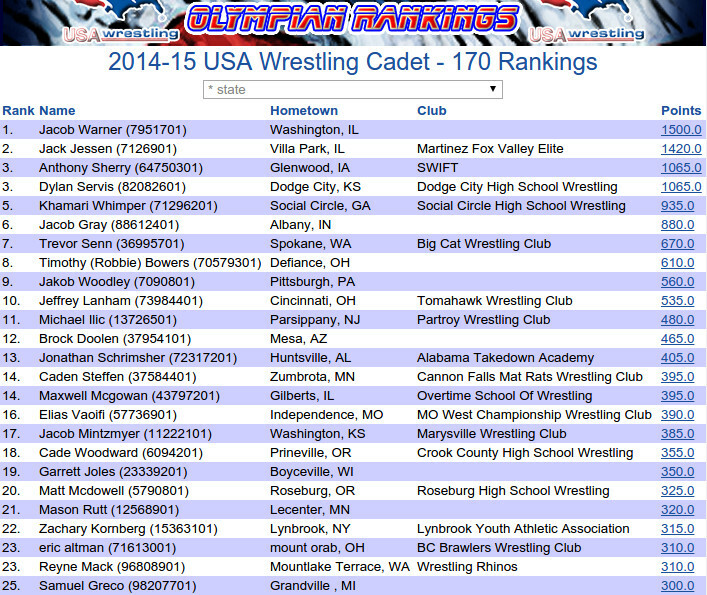 Cadet in the country by USA Wrestling’s ‘Future Olympian Rankings‘! This ranking is based upon Caden’s performances at Greco and Freestyle tournaments this spring. Wrestling has given Caden the opportunity to travel to several different states to compete. Caden had a wonderful experience, made many new friends, and can’t wait for next year to do it again! Tell your wrestlers to ask Caden about his experiences, he’d love to share with the little Cougars! If you have questions about how to get involved with spring-time wrestling, please contact Link Steffen or Chris Lexvold. We’d love to see several ZM wrestlers listed in these rankings next season!